A summit meeting (or summit) is a meeting of different heads of stateis the generic term for the individual or collective office that serves as the chief public representative of a monarchic or republican nation-state, federation, commonwealth or any other political state. or government, generally with substantial media exposure, stiff security and in a given agendais a list of meeting activities in the order to be taken up and discuss all if the related issues. 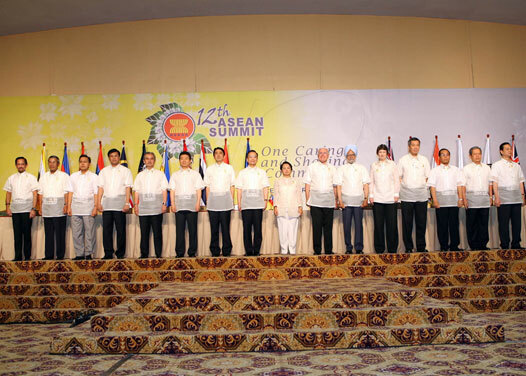 It usually includes one or more specific items of business to be considered..
President Gloria Macapagal-Arroyo poses with her counterpart leaders of the Association of Southeast Asian Nations (ASEAN) member countries and ASEAN's dialogue partners from Japan, China, Republic of Korea, Australia, New Zealand and India during a group photo session before the formal opening of the 2nd East Asia Summit Monday morning (January 15) at the Main Briefing Room of the Cebu International Convention Center in Mandaue City, Cebu.